All About Batteries, AGT Battery Supply: What is a Silver-oxide battery? A silver oxide battery (IEC code: S) is a primary cell with relatively very high energy/weight ratio. Their cost is linked to the price of silver. 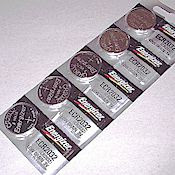 They are available in either very small sizes as button cells where the amount of silver used is small and not a significant contributor to the overall product costs, or in large custom design batteries where the superior performance characteristics of the silver oxide chemistry outweigh cost considerations. The large cells found some applications with the military, for example in Mark 37 torpedoes or on Alfa class submarines. Spent batteries may be processed for their silver content.